Reliable and affordable domestic cleaning services in West Kensington W14 performed by professionally trained cleaners from First Class Cleaner. Get a free and non-obligatory quote now! If you are leading such a busy way of life that you can hardly find a few free hours to do the cleaning, opt for the professional domestic cleaning services, delivered seven days a week in all Greater London areas. Book now and get your house neat and clean all year round without making any efforts. We know that at first, letting an unknown person into your home can be strange that’s why we give every client the chance to meet their maid prior to the cleaning service so they can get to know each other and discuss the procedures that need to be performed within the property. The service can take place while you are out so any disturbance is avoided. If you want to give your maids some directions, they wouldn’t mind working under your supervision. Don’t miss the exclusive opportunity to live in a neat and healthy environment without wasting your energy of savings on that. 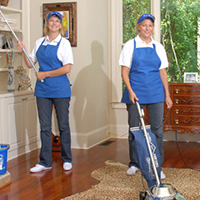 The price for both – one off and regular cleaning services is fair and the quality is exceptional. Contact the call centre supporters and schedule your domestic cleaning service now. They are prepared to arrange your maid at a day that best fits your availability and give a detailed answer to all your questions.